The Olympics are clearly in a mire. So few cities wanted to host the 2022 Winter Games that they’re going to be in Beijing—which is 55 and 100 miles from its two mountain venues, respectively, both of which barely have any snow. 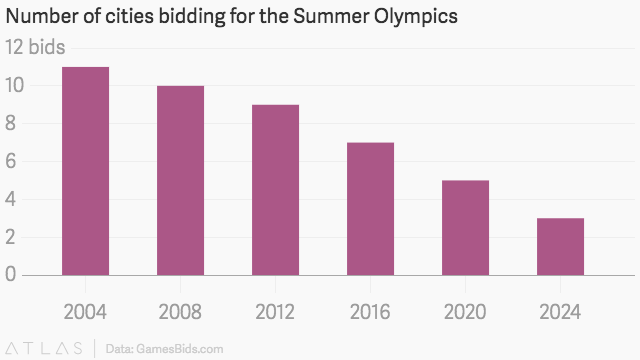 There are only three bidders left for 2024, the lowest number since 1984, when problems like shootings, terrorist attacks, and boycotts at previous Games had so tainted the institution that Los Angeles was the only city that finalized a bid. And, now, Tokyo 2020 is facing such a backlash over cost overruns that rumors emerged this week that some events may have to be moved to South Korea. “We’re seeing the slow death of the Olympic Games,” says Amy Bass, a sports historian at the College of New Rochelle. However, even cities that have the money and infrastructure—like Rome, Boston, and Oslo—are now pulling out, with large opposition movements rising up to point out the massive costs of Games like Sochi 2014, which totaled $51 billion. This can leave autocracies embarking on vanity projects as the only option. Last Winter Olympics, for example, was expected to be in Oslo, but the city balked because of the high costs of the Sochi Games. “It came down to two dictatorships: China and Kazakhstan. That was depressing,” says Wallechinsky, co-author of multiple editions of The Complete Book of the Olympics. Many are now looking to LA—the last city “to really knock it out of the park,” as Bass puts it—to come to the rescue again this time. But their 1984 model of using mostly private funding and existing facilities is again not one many cities outside the West can replicate. But there are still other ways to make the Olympics viable for diverse host cities. If it’s an option for Tokyo to farm out events like canoeing and rowing to Chungju in South Korea, why not let two cities officially share the Games? This would halve the costs for each city and let them each choose to build stadiums that would actually be used in the coming years, instead of leaving behind decaying white elephants, as seen in Beijing and elsewhere. Arrangements like this have been made before—Bass points out that in Atlanta 1996, sailing took place 250 miles away in Savannah. That’s further than the distances between a plethora of European capitals, like London and Paris, or Brussels and Amsterdam. “It’s certainly viable—it’s certainly been seen in the case of soccer. The European Championships is often co-hosted by a couple of nations; the Commonwealth Games has also explored that avenue,” says Matthew Llewellyn, a sports historian at California State University, Fullerton. There are downsides. Wallechinsky notes it would dilute the unique international atmosphere of the Olympic Village, while Llewellyn says it may be hard to persuade two countries to split the glory of the Olympics. ”The Olympics have been seized upon by governments throughout history as an avenue of nationalism and pride. I’m not sure if hosting the Games is going to be as appealing to a host government that’s going to have to share the pride and adulation,” says Llewellyn, author of Rule Britannia: Nationalism, Identity and the Modern Olympic Games. One compromise could be spreading the Olympics around a country instead of just having it in the capital city, Wallechinsky says. That way, national governments could shoulder the costs, and they could build stadiums in cities where those sports are most popular. Letting cities hosts the Games twice—either consecutively or with a 12- or 16-year gap between them—could definitely give cities more bang for their buck, Llewellyn says. However, one city holding the Games twice in a row could mean less excitement and lower ticket sales the second time around. Meanwhile, having a longer gap between Olympics leaves the Games ransom to that country’s economic fortunes, Wallechinsky says. Athens 2004 is blamed by some for pushing Greece over the edge into financial meltdown, and there’s no way it could host the Games again in 2020. So, holding them twice may have to be optional for hosts, rather than mandatory. 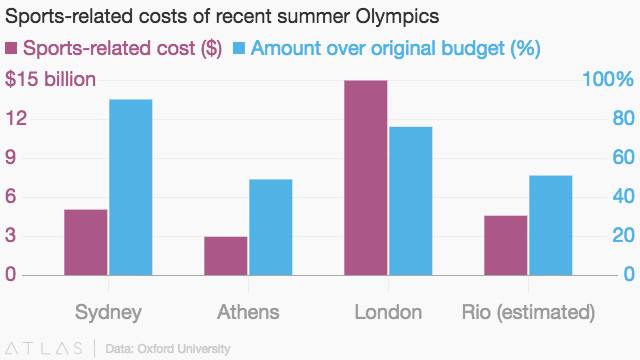 Do we really need all the expense of changing city every two years for a Winter or Summer Olympics? Not to mention the environmental cost of building new structures every single time, and the uprooting of communities in places like Rio and Sochi? Instead, some suggest having one permanent Olympic city (Athens or even Olympia would have the historical claim) or a handful of cities that could rotate—say, one per continent. “Originally the idea of moving the Olympics around was to expose different parts of the world to the Olympics but now in the 21st century, almost 99% of people who follow the Olympics are on TV,” says Wallechinsky. 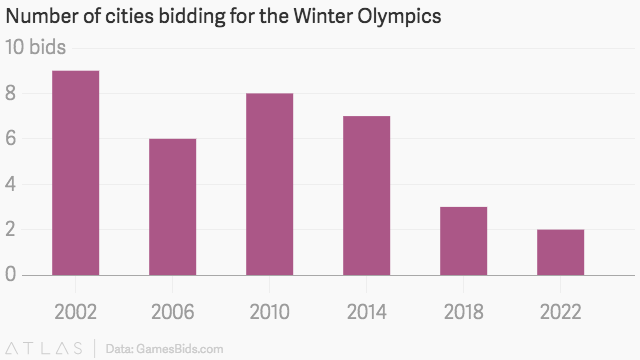 A permanent home in Greece would obviously be tricky right now if the country itself had to pay for it, but the IOC building its own venues in the country is a possibility—the organization’s projected revenue for 2013-2016 is $5.6 billion. Additional private sector investment may be easy to come by, too; NBC paid $12 billion for the TV rights to all the Games between 2014 and 2032. Given dwindling viewing figures at Rio, a more direct investment slice of the pie may well be intriguing. Or should the IOC just stop being difficult? Which leads us to the big culprit in Bass and Llewellyn’s eyes: the IOC itself. “The IOC have always really paid lip service towards this notion of legacy,” he says. “Really what rules the roost is finances—it’s TV broadcasting deals and how much can be made for the Games.” Whatever the solution, the IOC is going to have to make some radical changes. But, beyond exceptions like banning South Africa over apartheid in 1964, radicalism isn’t something that comes naturally to the organization, Bass and Llewellyn say.